I titled this post "another soothing master" because I have done a soothing master before. 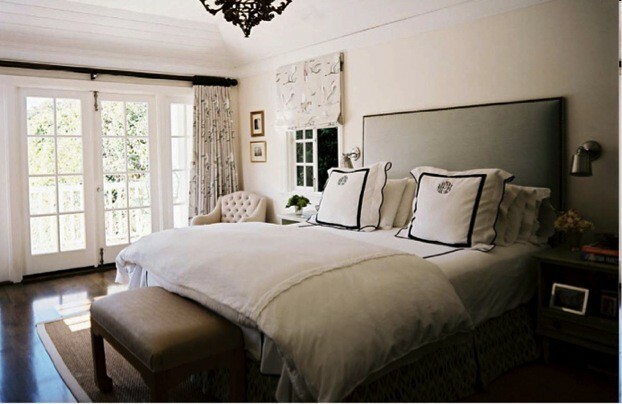 In fact, I think ALL bedrooms should be soothing. As I've mentioned before, I always ask e-decorating clients to send me inspiration pictures so I can get a sense of what they want out of their room. It's not so much "I want my room to look like this" as "I want my room to feel like this". 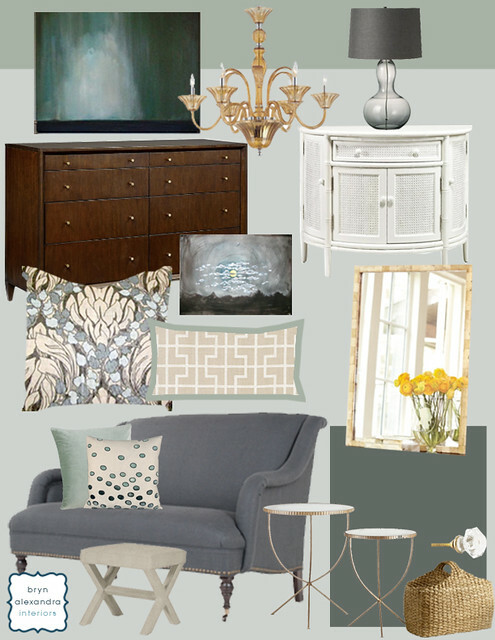 This particular e-decorating client mentioned she like grays and teals. Um, yes! That's what our new master bedroom design uses too. Love! This reminds me of Shutters on the Beach in Santa Monica - and you can order (at a price!) all of their decor. 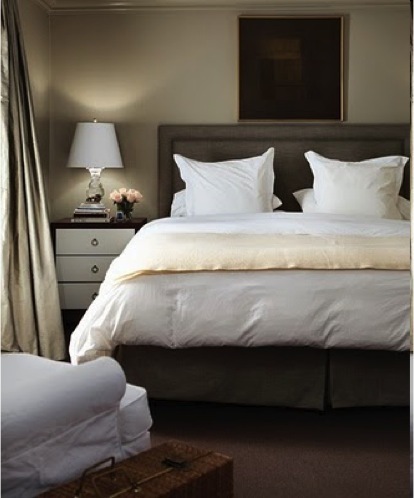 I am currently working on my master bedroom and all of these photos are great inspiration! Your mood board is beautiful! I am finally coming around to grey since I am more of a warm tones gal. But I would definitely feel right at home in this room! I'm in love with the patern pillows on the first bed. Do you know the pattern name or source of the picture? Thanks! Great design board! Loving your blog! haha too funny! I didn't realize it until now but it does look like a LR :) The bed is already in the room and new so it's not in the board. 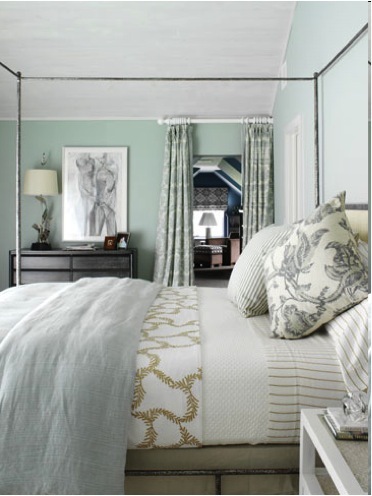 It's a neutral upholstered headboard with nailhead trim. Very pretty! Oh wow! I love the design board you came up with. Great job, Bryn! Yes, for soothing master! These are all calling my name! How pretty! Love your design ideas for this room! I agree! They are all very soothing! I love your picks too. The fabrics are totally up my alley! 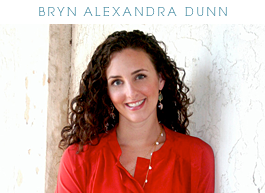 Bryn, I'm really liking the delicate end tables that you've shown in your design board. But not the white footstool that's in front of the blue settee. Reminds me of a picnic table. I'd really like to see a footstool or covered bench with more delicate brushed nickle legs that has a teal fabric covering or that wonderful beige angular pattern on the cushion. So beautiful and soothing. A true retreat! I love the charcoal loveseat you shared...but to ask a strange question: why are exposed legs often mis-matched on pieces like that? I love the detail on the "front" legs, but the back legs always seem like an afterthought. Those are some lovely rooms! Defintiely soothing...What an inspiration!! I love it, and I love that color palette. I can't wait to see the finished product! So pretty. I think one common element those rooms boast is the lovely, soft light that floods in through the big windows. Makes a difference. 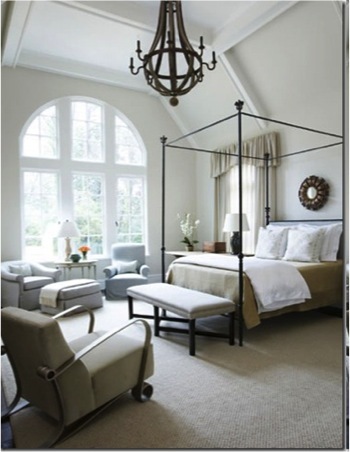 Love Bedroom # 2 -- What a lovely plan for the bedroom!